Well done to everyone who competed at the Cults Novice Gala today, you all made your club proud. For some it was one of their first meets apart from the club champs, so well done on that part too. 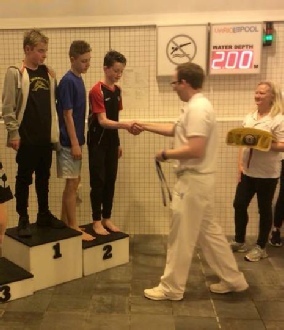 We had some exceptional swims, with swimmers beating their times by a large margin being the ubiquitous occurance of the day's swims, and even people beating the times they did 2 weeks ago at the Aberdeen ASC Mini Meet. 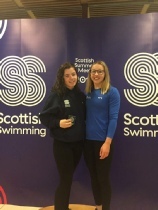 A special mention to Lily Pirie for Dyce 'Swim Of The Meet' with a phenomenal 50 FC swim, seeded as 13th in her age group and 52nd overall then going in and smashing her PB by 12 seconds to finish 3rd in her age group. 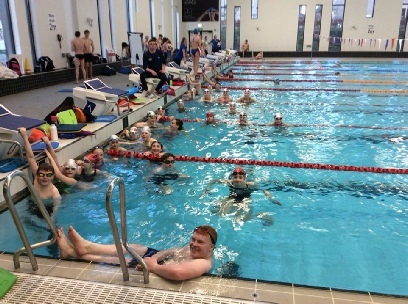 With a team of 14 swimmers, it's rather satisfying to see that not only are Dyce becoming a stronger team at competitions, but with the growing membership of the club, the sheer size of the teams we bring to competitions are bigger and create more of a presence on the swimming scene. Onwards and upwards to our own mini meet in 4 weeks time! 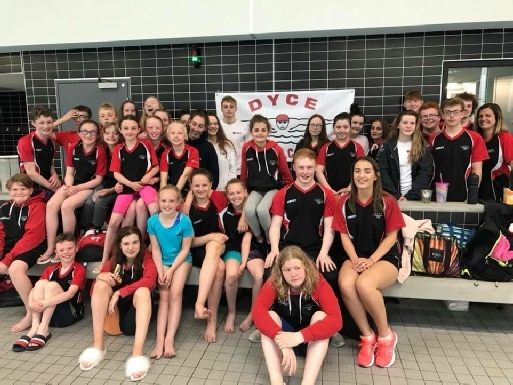 In the words of our own head coach, Sean Breen: " #Dyce #1team "
Very successful weekend for our small team this weekend at the North District Age group champs. Some excellent swimming all round. Olivia put aside nerves to go under SNAGS considerations posting 31.52 for 50 freestyle. Sarah was District champion in the 200 backstroke. 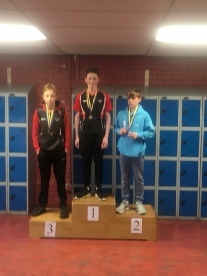 We had some new members join who all performed well finishing on the podium numerous times including a 1,2 in the 100 freestyle. 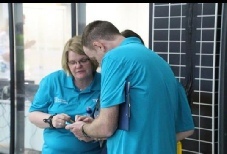 They were very much part of the team and were good with the younger swimmers. All our relay teams did exceptionally well. 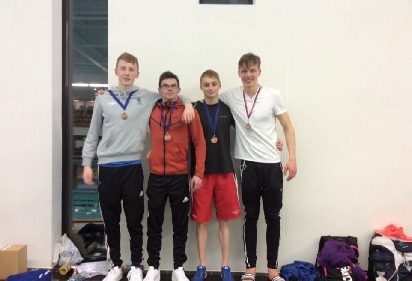 Our boys 15+ team of Brendan, Conner, Louis & Fraser managed to get themselves a bronze medal in the 4x100 medley. Five Dyce swimmers enjoyed their 'swim skills' session with Hannah Miley at ASV with Lauryn McLean attending as their coach. A great afternoon. A huge well done to all the swimmers competing today at our own mini meet; you swam excellently! More collectively, all the Dyce members who attended, whether it be officials, helpers, swimmers, or just being a supporting parent: you made me extra proud to stand on poolside today knowing I was part of such a hard-working, morale-filled team. A special mention to the 3 swimmers that competed for the first time today - Grace Duncan, Caitlin Sinclair and Morgan Higgins. You all did the club very proud and sincerely hope you enjoyed it as much that'll you'll partake in many more! Bubbles also stayed the whole day and supported his team: excellent to see such a senior member still supporting his club with such dedication. However, he needs a club kit update... Joyce??? 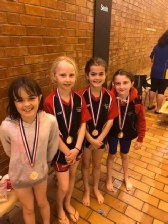 As for medals, in the afternoon we certainly had a significant medal haul as the more experienced swimmers competing in their last year of mini meets from J3 squad led the way for the younger swimmers. You were excellent role models for the younger ones who stayed to watch and support, and I wish you luck for those of you competing at SNAGS next week. 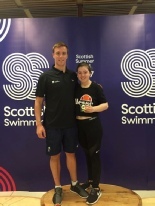 Last of all, a huge well done to the recipient of the Kathy Milligan Trophy, Jessica Mackay, for not only swimming her absolute socks off with her team mates in her own events and the relay, she was also an excellent team leader for the swimmers who weren't quite as experienced. She even went as far as to follow in her mum's footsteps and take the land warm-up before the first session. Massive thanks and well done young lady. Incredible effort from all that swam individually and in the UOA relay teams at SNAGs this week. It's brilliant to see you guys competing with the best swimmers in the country. Congratulations to our finalists and medal winners. Well done and thanks to our officials too, who always do a brilliant job for us! I hope this inspires the next generation of young ones at Dyce ASC. Any pictures feel free to send through to us. 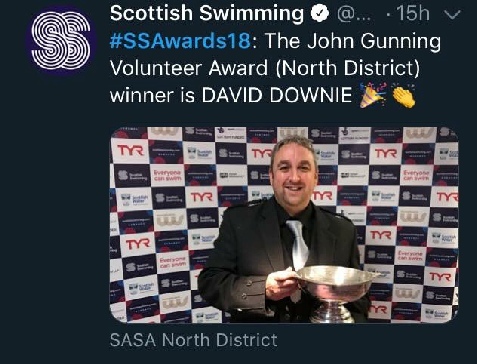 A big well done from all at Dyce ASC, such a great achievement & well deserved after all the hard work he put in. We look forward to hearing more success from him. So across the whole weekend we had a group of swimmers competing at the Westhill Invitational meet. My first meet i've coached at for a good while now, and what a blast i had, Rob came for the final session on sunday and we were both just itching to get in and race ourselves! 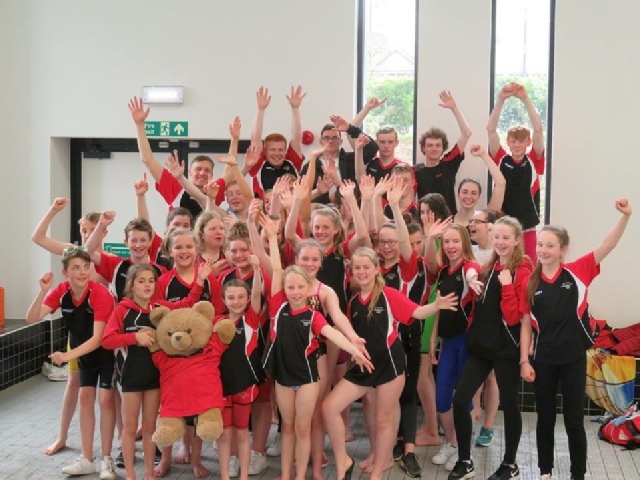 Fantastic team spirit for the most part of the whole weekend, and some top quality swimming especially with no rest during a period of hard training. Every swimmer swam at least one very good swim, and there were a multitude of PB's aswell. 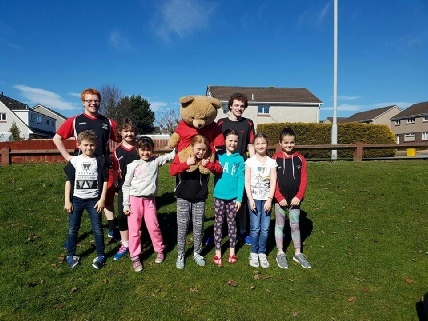 Swimming across the weekend we had Lucy Alexander, Morgan Johnston, Abbie Ashton, Nicole Cooper, Kate Cassidy, Brodie Dines, Owen Simpson, Dominic Fraser and of course our very own coach, Stuart Davidson. Stuart proved that training is paying off, taking his 100 fly down to a 1.07, a whole 2 seconds faster than myself so i better get training! Lucy finally decided that she could go out fast in the first half of a race and went out on her 50 pb for the 100 back, finishing in a fantastic time of 1.18.9. 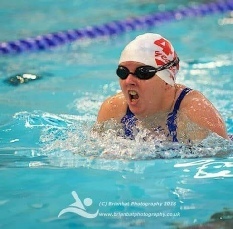 She also was put up against Stuart Mackintosh in the bc leg of the medley relay, and swam a pb of 36.4! Morgan proved how determined she was to earn a place on the 4x50 free relay team in the 50 free event on sunday afternoon, beating her pb to go 34.0, and upon being put in the relay team, stormed the 3rd leg to post a 32.9 on my stopwatch! Abbie just swam the one race, the first event on saturday morning, in which she swam extremely well having had a hypo in the morning before hand and feeling rather nervous! 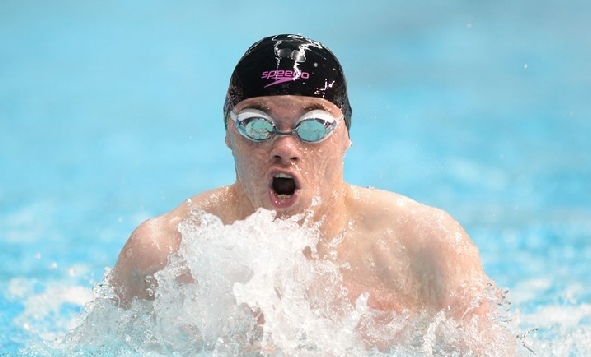 Owen has been training seriously hard recently, and it showed as he posted a massive PB in the 200 back to go 2.48, again in the 100 back to go 1.19, and again still in the 50 back to go 36! 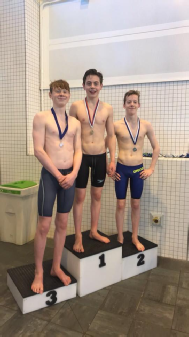 Brodie has also been training hard and again proved himself in 200 free posting a 2.30, and again in the 100 free smashing his pb to go 1.09! And a bit of hilarity, just remembered that he swam an extra 75m in his 400 free because the boy next to him wouldn't stop, whole poolside was going crazy😂! Still posted an excellent time of 5.16. Kate showed that even though she had a lot of things to work on in her races, she was still managing to PB posting a 2 second PB in her 200 fly, and also posting a solid 5.16 in her 400. Dominic turned up on the Saturday afternoon although i was then informed he wasn't actually swimming till Sunday afternoon! However he turned up on Sunday and swam absolutely amazingly, getting a 19 second pb in his 100 free to post a 1.22. Really great swimming guys, lets keep up the hard work under Sean, Lauren, Rob and Stu, and it was an absolute pleasure coaching such an enthusiastic bunch of kids that all got on so well with eachother, it made me proud to represent Dyce the entire weekend and made me even more excited to get back into the pool racing again! 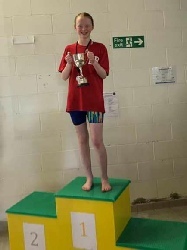 Great swimming from all the swimmers representing Dyce this weekend, including members at their very first competition, through to one of our own team captains. 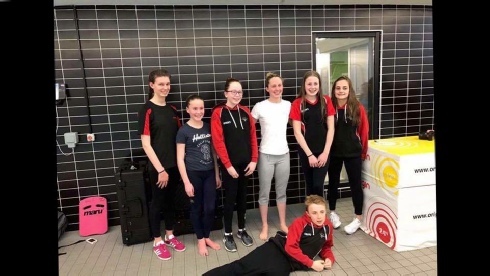 Today we had a team of 16 swimmers representing Dyce from across the club, with a special mention for Fay Cruickshank as it was her first competition with the club, yet stayed the whole day to support her team mates. A huge number of PB's were posted over the course of the day, showing that their hard work is definitely paying off. 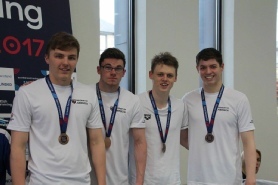 We also had a number of medals acquired across the day, including a fantastic 4 x 50 free relay to finish, comfortably swimming to gold medal position. Excellent performance from everyone this weekend guys, excellent ambassadors for Dyce. Additionally, excellent team spirit too, fantastic to see :). More photos will hopefully be uploaded onto our gallery page soon…. Coach report by Rob Morrison…. Just wanted to congratulate everyone for a fantastic day at the pool. 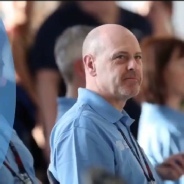 Before we even mention the swimmers I think its best to start by thanking everyone involved in the running and the organising of the meet as I'm sure that we will all agree that they did an amazing job catering for not only our swimmers but the SDS swimmers as well. In the pool it was a brilliant day for Dyce. Whether it was the seasoned veterans or those new to swimming long course everyone performed really well with some fantastic times on show. 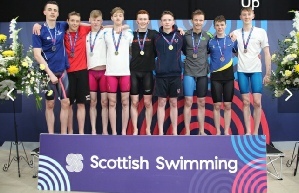 We also had a fair few medals in both the individual swims and relays which is great to see especially at our own meet. A special thank you to our swimmers within the UoA program that came along to not only support their team mates but swim some good times and help win some medals in the relays. 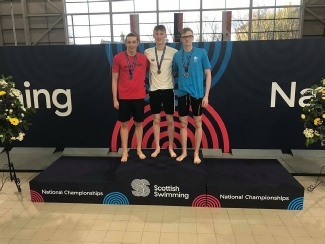 For those still with competitions this season; ND Development meet, Scottish or British nationals, today should hopefully set you up nicely for those, however for all of those who don't, today was a fantastic way to end the season in style. Well done to everyone. 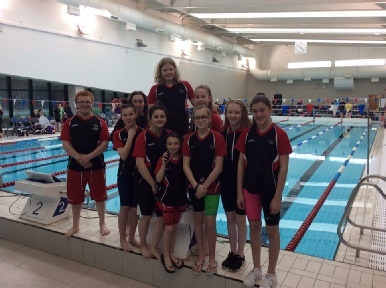 A big well done to our young swimmers at Peterhead Mini Meet, with a few medals in the bag! Thanks to Rob for superb coaching as always. 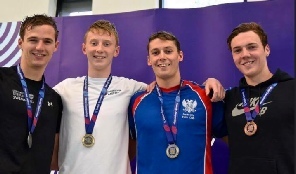 A big well done goes out to all the Dyce ASC members that represented the UOA team at the Scottish Open. There were some brilliant swims over the course of the week in individual and relay races. 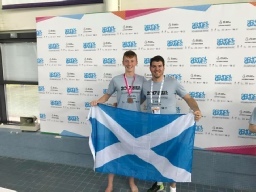 Congratulations go out to Conner Morrison and Fraser Agnew on their successes (photos above). Conner took Gold in the 200 Freestyle and 200 I.M, Silver for the 100 Breastroke and Butterfly and Bronze in the 100 Backstroke. 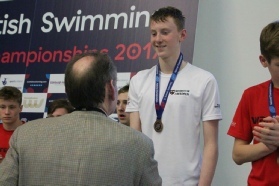 Fraser won Junior titles in both the 200 and 800 Freestyle achieving Silver squad times in the process. Best of luck to everyone at the Scottish and British Summer Meets! Well done to all on a fantastic year. Final medal table for 2016/17 season. 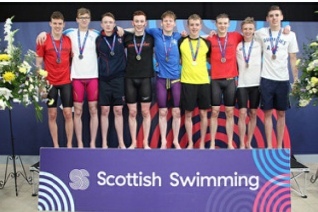 Another fantastic weekend for Dyce members swimming as part of the UOA swim team at the Scottish Summer Meet. We had some excellent personal bests across the board and finalists every night. First of all well done to everyone for an amazing effort. Congratulations to our medal winners. Great end of season for everyone. Best of luck to Sarah Fraser who still has the British Champs to go! An excellent day across the board, with a large team of 17 swimmers partaking in many events across the course of the day. 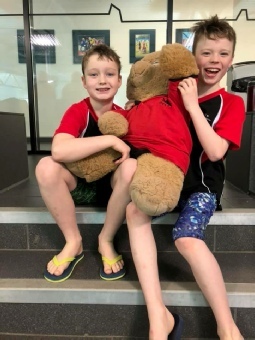 Made Rob and I very proud coaches to see all of our swimmers giving their all in the pool and even better, out of the pool too - such a fantastic team spirit from our wee ones. 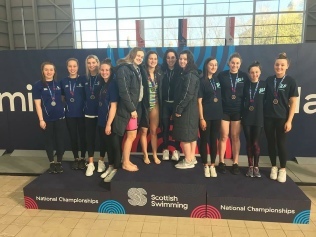 An extra mention for some swimmers who are still within their first few competitions ever: you all did very well and are all proving the future of Dyce ASC is safely secure and on an excellent path. Last highlight and one of the best has to be both of our relay teams in both the morning and afternoon - you made us and the rest of your team very proud! Another meet gone by, which, for some, was the first of the new season; for others it was the second after the Dunedin Challenge last weekend. Some fantastic swims across the board, from our youngest up to our newly-appointed UoA members. We had some superb swims and many personal best times were broken, but most importantly it seemed like everyone enjoyed the day. Huge well done to everyone who swam and all the officials for giving up your time to let the kids have a meet to swim at. 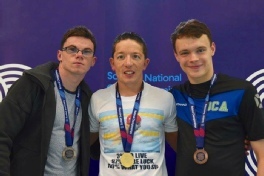 David Downie (judging) , Fraser Agnew (swimming) and Sean Breen (coaching). 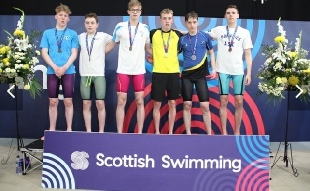 Well done to Fraser on his bronze medal in the relay. 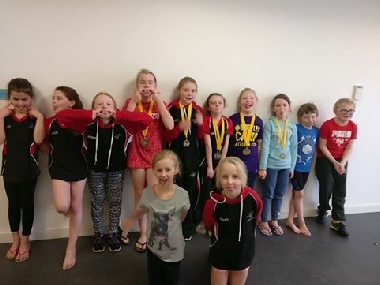 As you can see, our swimmers are performing very well and I am delighted to see all levels of the club performing to a standard that makes the club, and themselves, very proud indeed. Thanks guys, onto the next one! A big thank you from the swimmers to the coaches again for giving up their time so early on a Sunday AM! 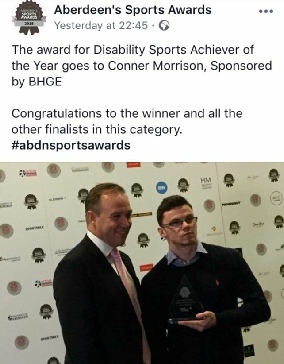 Congratulations go out to Conner Morrison for winning the Disability sports achiever of the year for 2017 at the Aberdeen Sports Awards. 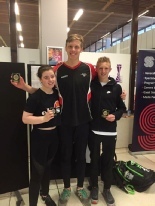 Excellent weekend for our members representing the UOA at the ND open. Some great swims all round. Many swimmers had personal bests and made finals with some awesome times! 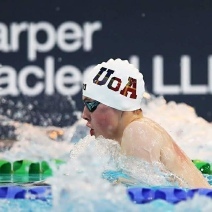 Fraser Agnew won the 16/U 100 freestyle title and finished 6th in the open 400 freestyle. He also won the 16/U 200fc in 1.53! Ethan Lindsay won the 16/U 200 breastroke & got 2nd place in the 16/U 100 brs in 68! Awesome swimming from all our swimmers and well done to the UOA for winning top club for the weekend. 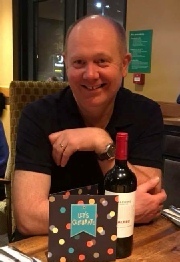 Anyway, as it was two of our members’ first meet, we especially hope they enjoyed it as much as Rob and I did coaching there: Amy and Arran were both very excited to be there and were a credit to the club. 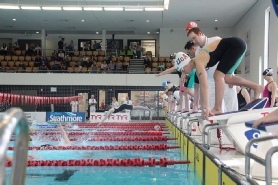 We had a great number of swims across the day for all our swimmers to watch and of course swim in, and I have to say I was exceptionally impressed with our team and how they swam, behaved, and supported each other (because after all, there’s no I in Dyce). However, Rob and I do have a special mention for the swim of the day: Carla Dines, with her extremely speedy, silver medal winning swim in the 9-year-old girls’ 50m Breaststroke. If you guys keep this up, we could see some records over a decade old being broken at the club championships! 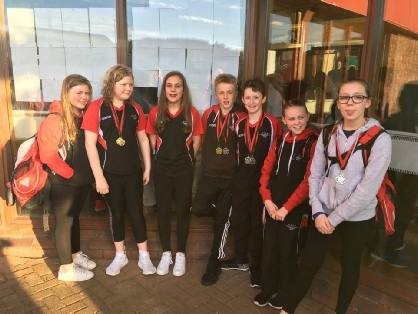 Well done to all 5 swimmers that swam at Alford meet at Fraserburgh. For the amount of training they are currently doing I wasn’t expecting the chunks of time that the group were taking off their times at this point so it’s hugely positive. Special mention to Emma Cobb who continued to smash all her times through the day. 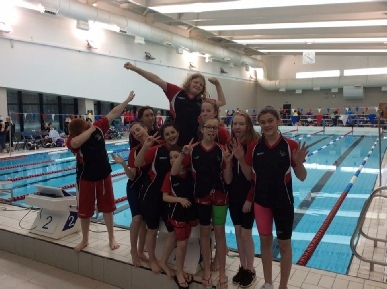 Some awesome swims at the North District age groups. Personal bests being smashed all over. 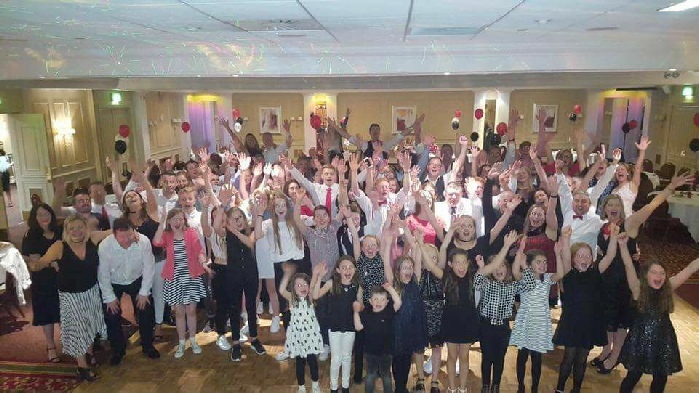 What an excellent weekend it was for all members of Dyce. Some incredible swims by so many. Well done to everyone for acting like athletes all weekend. 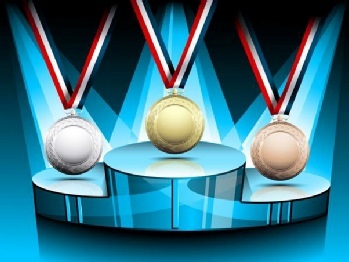 Congratulations to all swimmers, especially our medal winners as follows…. 2 SNAGS times achieved by Megan L, one qualifying (37.33 50 brs) and one consideration (1.23.17 100 brs). in great need of more judges, so much appreciated. 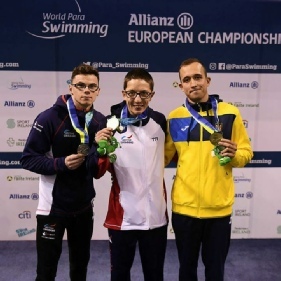 Congratulations go out to Conner who took the new world and European record in the men’s S14 100 brs in 1.05.74. 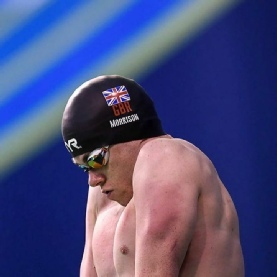 He also broke two Scottish Records in the 200 Individual medley (2:18.74) and 200 Free (2:03.29). Massive congratulations to him and his coach Gregor for this fantastic achievement. 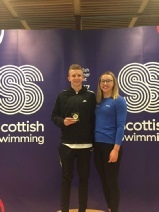 An excellent day for all members of Dyce ASC at their club champs. Some quality swimming across the board and excellent times achieved. Big thank you to all officials (Dyce and other clubs) who helped make it accredited and all other helpers/parents for their support. Well done to all the swimmers, 6 club records were broken, some standing from the 1980’s! 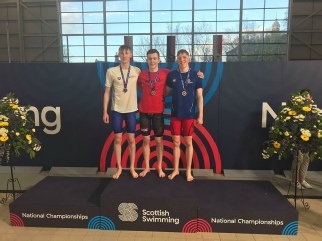 Fraser Agnew won the the Scottish short course Junior titles for 400fc & 100fc. 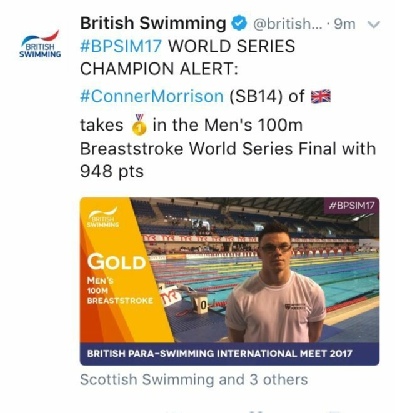 Fantastic achievement, a big well done to Fraser. Photo on left - 2017 trophy winners. As well as our December Club Championships event trophy winners, congratulations go to all our other trophy winners as below…. First of all, I would like to thank all of the parents for being so helpful and supportive, and the swimmers for being so well-behaved in the absence of our head coach. 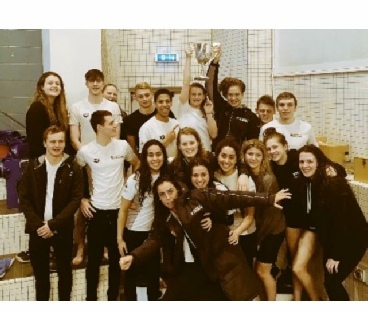 There were many cases in which our swimmers dived in for their event and completely outclassed the other swimmers from start to finish: this goes to show the benefits that result from your training endeavours. An additional note for the older swimmers: I was very impressed with your behaviour, especially with and around the younger swimmers. 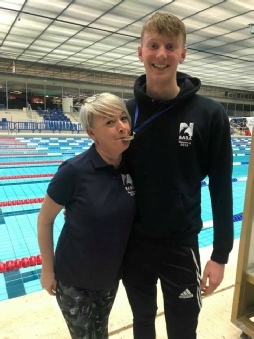 It would seem we have some more future coaches among our swimmers... Also a special mention for Callum Brice, who swam in his very first away meet! In conclusion it was a very successful away meet and an excellent team building weekend for the swimmers who represented the club very well. I had the joy of attending the Silver City Masters competition yesterday at ASV, at which there was the uni swimming champs as well. 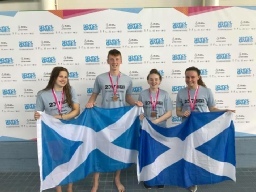 We had 4 swimmers from Dyce, with Vicky Jolly and Rachel Wood representing Dyce Masters and Stuart Davidson and Brendan Johnson representing Aberdeen Uni. All swam very well, with some slight pb’s as well as finals made for both Brendan and Stuart. As for my masters swimmers, Vicky showed great determination to complete 100 IM and all four 50’s, getting pb’s in a few events and also a gold medal for her 50 fly! She also did a very good job of convincing more than just herself to compete, proving to be a very positive influence in training and out of training too. All you masters should take a note! Rachel had an interesting meet, being new to masters and it being her first competition for 8 years, she was very nervous! Her backstroke start was fun to watch to say the least, but she more than made up for it in her 50 fly, previously telling me she would never compete again, then telling me she’d like to go 35 for 50 fly, she dived in and went 33.8, getting the bronze medal for it too. So still some of the fly swimmer in her from her younger days! All in all a very enjoyable day. 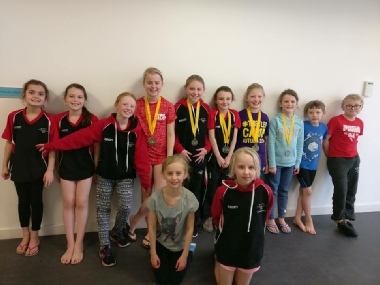 The long-awaited, eagerly anticipated double meet report for both Aberdeen and Cults' Mini Meets is finally here! A lot to say here but I'll try to keep it compendious. 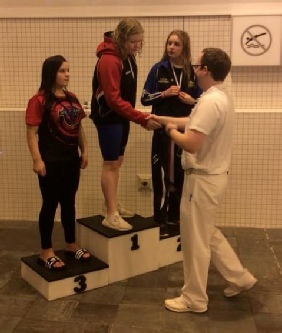 An early start with the girls' session up first at Aberdeen Mini Meet kicked the day off to a good start - 3 bronze medals in the form of Eden and Carla for 50 Breaststroke and Eden's 50 Butterfly, with many sizeable and significant improvements on personal best times. Again, the Dyce crowd proved to be very mature with the way they conducted themselves in front of others and to each other, which we as coaches take an especially sanguine view on. Concluding the morning, the relays were performed very well and demanded a very positive atmosphere for all the swimmers. 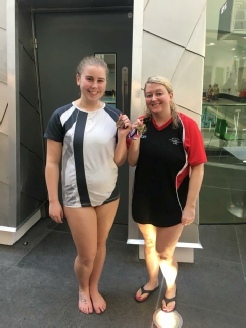 A special mention to Melissa Stewart who swam at her first meet and did exceptionally well - hope to see you at many more in the future. The boys then followed suit in the afternoon, with great swimming and team spirit, despite the limited number of boys the club has - you all do the club proud, finishing on a high with the relay teams swimming very well. Moving forward by two weeks, we saw Cults Mini Meet well attended, with (almost) all swimmers joining in the Conga with great team spirit, and the encore Conga, and the one after that... Meanwhile, the coaches eventually tutored the announcer into knowing the term for a disqualification isn't a 'technical infraction' as he kept pronouncing it to be, much to his embarrassment...😏. 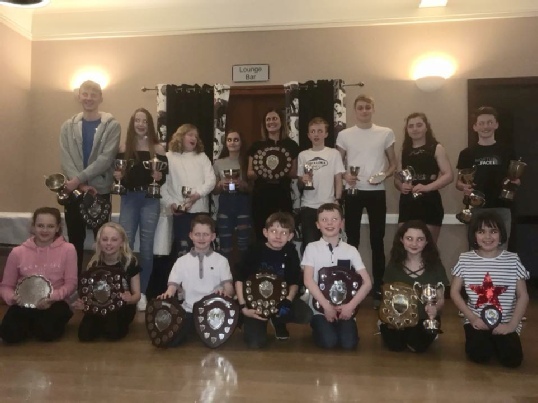 Anyway, the swimmers really outdid themselves at Cults, with quite a number of medals and some superlative improvements on times, and most importantly all of the swimmers did their club proud with their behaviour and their swimming discipline. 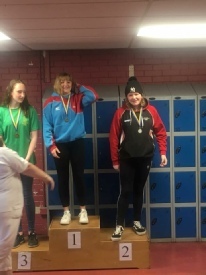 A special mention for swim of the day goes to Libby Fawns for her prodigious 50 Breaststroke, bringing her time right down to a 52 and smashing her way onto the podium in style. 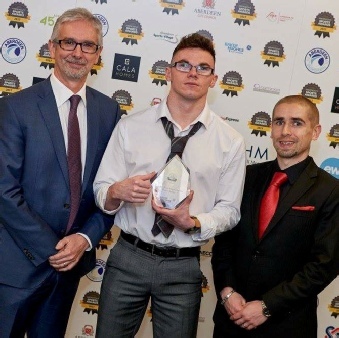 Huge well done guys - good to see the hard work paying off! Back to the hard work this week though! 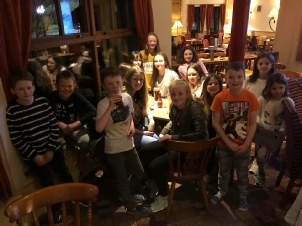 Well done to all the young ones who swam at the mini meet yesterday. We had some very good personal best across the board from all swimmers. Special mention to Logan and Lennon on their first competition as Dyce Members. 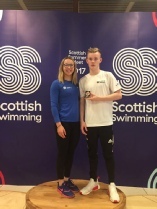 Both swam very well and Logan had 37 seconds worth of personal bests and a bronze medal, then went on to win the “Dyce Swimmer of the meet” Kathy Milligan trophy which he will be presented with in the near future. It was nice for me to do a competition to see the younger members coming through the club and I was very impressed. Keep up the good work guys! Very well done to all swimmers today. Some excellent swimming across the board from all squads. 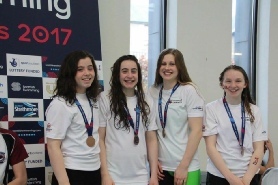 An awesome swim from our 4x50 freestyle relay team secured gold in a nail biting finish. Well done Brodie Dines, Archie Johnston, Ellie Brice and Libby Fawns. 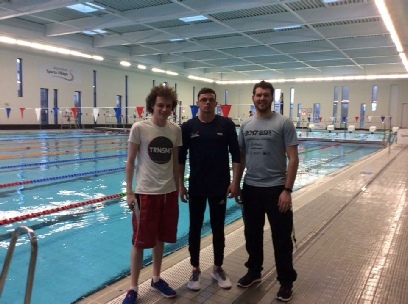 Big thank you goes out to Conner Morrison (British Para Swimming World Record Holder) for coming to visit us at ASV. 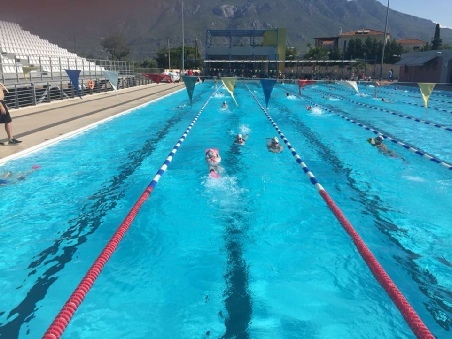 As he prepares to head to Italy in the next couple of weeks, it was great for him to take some time and help out some of our younger swimmers with their breastroke technique. Great spirit and effort by all swimmers and a fantastic turn out. 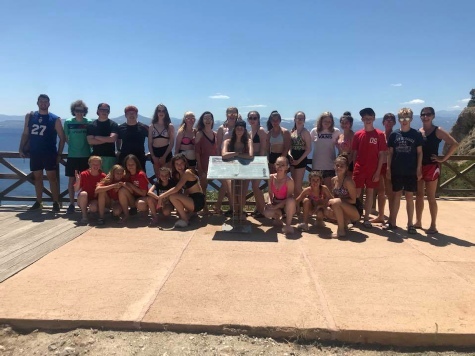 There were many noteworthy swims throughout the day with an abundance of determination and wonted maturity from our swimmers, which is always great to see. An excellent team effort in the relays didn’t go unnoticed either. A few special mentions go to the medal winners too! Keep up the hard work, we have the Hunting Meet next Sunday! I would like to take the opportunity to thank and congratulate everyone involved in our meet. We’ve already had a lot of positive feedback from other clubs which is great to hear. Big congratulations to Michelle and everyone else involved for organising another very successful meet. 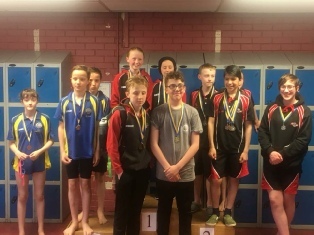 As this was the final meet of the season for many of the swimmers involved it was great to see them go out in style with loads of PBs and a few medals, throughout the day. Some very good swims from members of all three squads within the club especially for those swimming long course for the first time. 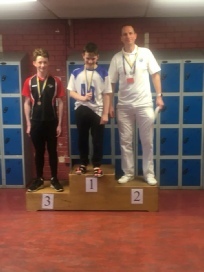 Special mention to Owen Simpson who won gold in 3 out of 4 of his events and Eva Smith who smashed both of her PBs in her first ever competition. It was great to see a team of 37!! Comfortably the biggest team at a meet that I’ve coached at. Once again big thank you to everyone that made the day as successful as it was and a huge well done to all of the swimmers involved. Well what a weekend that was for Dyce ASC! Over the weekend we had a number of meets going on that our members were representing at in a number of different countries. Isla Johnston and Sarah Fraser both had good swims throughout the meet. Sarah making the B finals in the 50/100 and 200 back where she finished 3rd. 🎉. Ethan Lindsay and Fraser Agnew both swam well in their events. 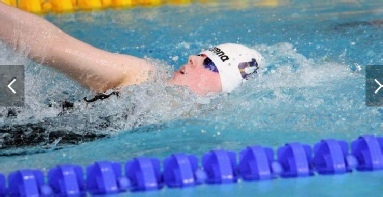 Fraser made the finals in the 50, 100, 200 and 400m freestyle. 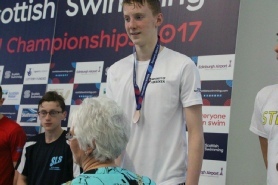 He finished 2nd in the B final for 50 free and followed it up with a silver medal in the Junior 200 freestyle in 1.55.81. 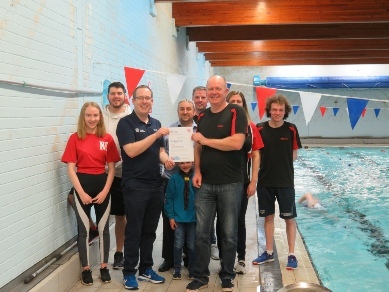 After months of hard work by some of the committee and coaches, we have our SwiMark plus accreditation. This makes us one of the few clubs in the city at this top level. Well done to everyone. Ellie Brice: Gold 50 Back, Silver 50 Breaststroke, DYCE SWIMMER OF THE DAY!!!! Also well done to all the other swimmers who didn’t get medals but swam very well. A great day all round and hopefully a good fundraiser for the club too! 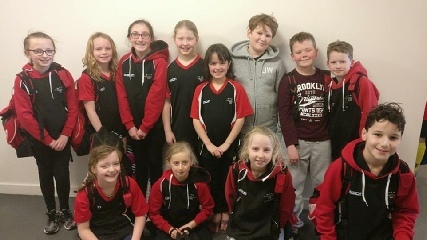 After a successful day at our own mini meet on Saturday we had a team of 15 swimmers travel down to the Arbroath St Thomas meet for the first time. As this is a meet that as a club we had never been to before we were not sure what to expect but, due to the brilliant performances and attitude of the group of swimmers that attended, will likely be a meet we go to again. Despite swimming the day before there were few signs of tiredness from the swimmers as they all swam very well with many PBs and strong swims throughout the day. Eva Smith: Silver: 50 Brs, Gold: 50 Bc, 50 Fc and 100 Fc. Amy Bell Reid: Bronze 50 Brs and 50 Fc. 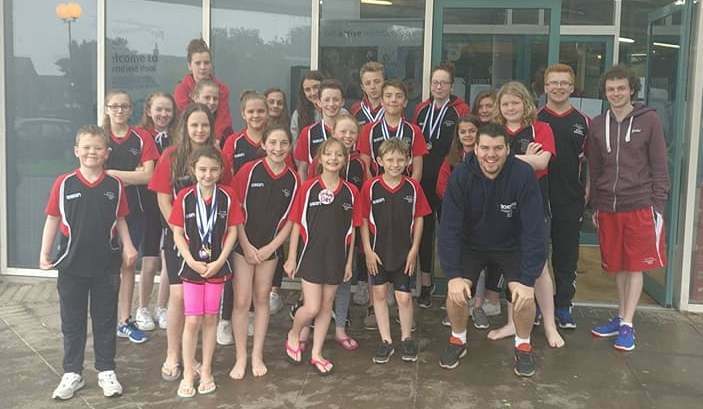 Well done to all the swimmers for a very good weekend. Day 1 - Layton had a really good personal best in his 100 Back and helped the boys 11-13 relay team. Sarah Fraser swam in the 200 back final. Fraser Agnew swam in the 50 fly final. 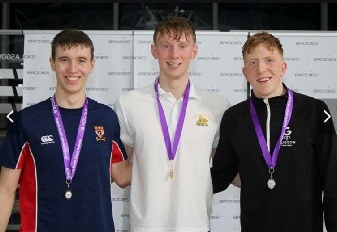 Day 2/3 - We have a national champion - Fraser Agnew wins the 50 Free in 23.91 & had a good 100m free in the relay too. Layton smashes his 200 backstroke time to be first reserve and followed it up with a solid 50fc. Kate Cassidy swam a strong 200 fly in the 15 year old age group to finish 15th. 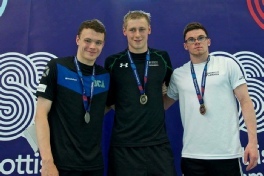 Day 4 - Fraser Agnew made himself double national champion as he won the 200 freestyle in 1.54.7. Sarah finished 7th in the 50m backstroke final. Layton had a great personal best in his 400 I.M this afternoon. Day 5 - A great last day at nationals for our members. 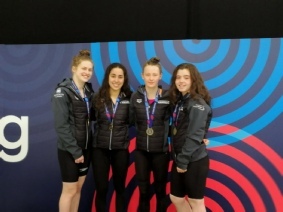 This time Sarah Fraser was national champion with her UOA 4x200 free relay team. 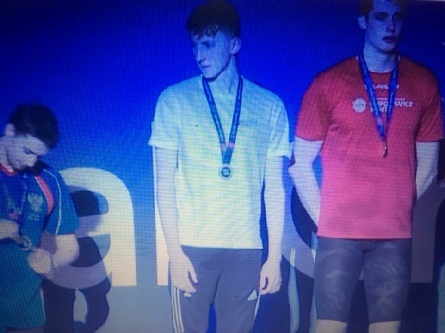 Fraser Agnew came home with silver in the 100 Freestyle to wrap up a good set of swims. Layton again had some good swims and helped the relay team to a decent finish. 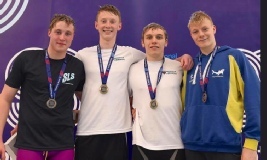 Cracking championships for our swimmers.